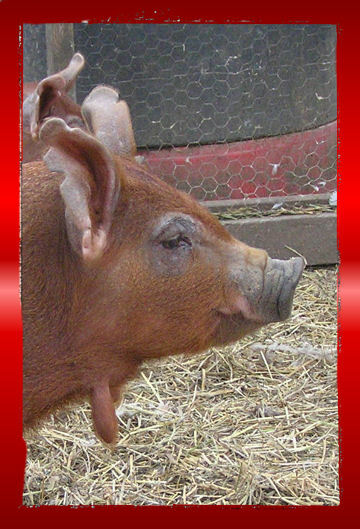 Piggums is a Red Wattle and Old Black English pig cross. She arrived at Meeting Place on April 1st, 2010 from Glencolton Farms. Nathan interned there for 3 months and every time I saw him I would ask if they could sell us a pig or two. I loved the wattles* and their red colour. Nathan kept telling me that he’d forgotten to ask or that he was sure they wouldn’t part with one… so it was with great surprise that I arrived home after a particularly exhausting day away to find Piggums in the barn!!! She is stunningly beautiful, incredibly smart and completely loveable. She is a very social pig and since she was our only pig for a month and a half, she has developed a mutual adoration with all of the people here. We love to give her the scrap bucket, feed her the weeds from the garden and give her scratches on the back and behind her ears. She puts her snout into everything and will nibble your fingers, pants or muck boots when feeling especially playful. When she has straw or bedding she will create a little nest out of it and there is nothing cuter than seeing her snuggled down and softly snoring. The flap hanging down is a "Wattle"
Piggums is going to be the leader of our pack of pigs. 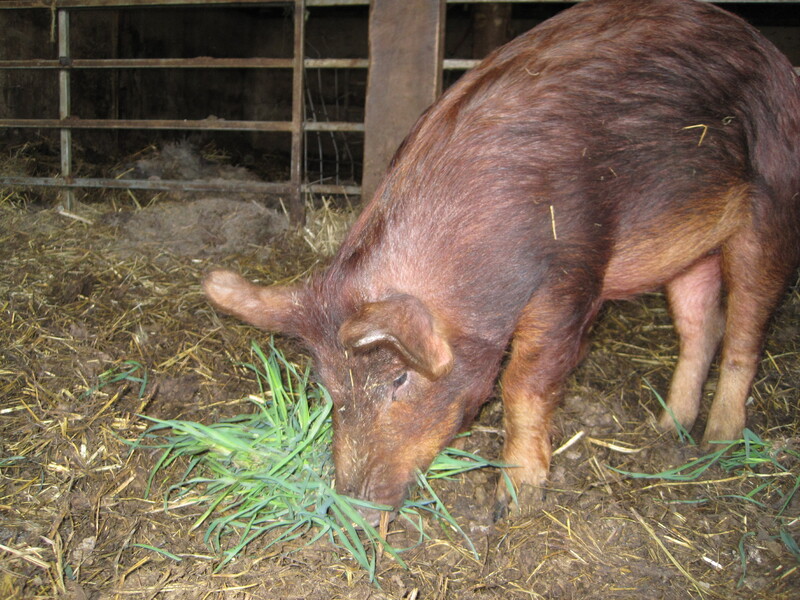 Since she is much bigger and her breed is one that loves to forage we are hoping that she will teach our Berkshires and Yorks about foraging once they are out on pasture in our neat pig enclosure with moveable pig hut. ~ by mcquaka on May 10, 2010.